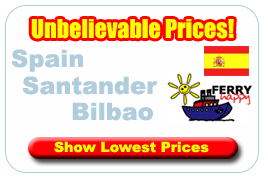 For that ideal family holiday why not take a ferry to the historic spanish port of Bilbao, ferries to Bilbao run on a regular basis from the Portsmouth ferry terminal here in the uk.Find cheap prices here and book online. Portsmouth is the second busiest port in the UK, each year 3.5 million people travel from Portsmouth to Continental Europe. It has excellent road links from London via the M3 and A3. Whilst it may not have the quickest journey times to France and Spain, it gives the passenger a more relaxing enjoyable journey. Portsmouth itself is the Royal Navy's historical home, the port is just north of the navel base. There's plenty to do at the terminal building, a gift shop and newsagent, a licensed bar, a cafeteria, a bureau de change, a cash point, a baby changing room, payphones, photo booths and public fax machine. At the end of the boarding lanes is another "Travel Centre" which contains a cafeteria, bureau de change, and gift shops. Situated in Northern Spain and running against the Nervión River Bilbao is a truly historic and cultural city of natural beauty. Fascinating scenery and attractions make a must holiday destination. Bilbao is Spain's 6th largest city and is situated in the heart of the Basque country, and also has it's own airport as well it's own ferry port. The only route by Ferry to Bilbao from the UK is to sail from Portsmouth. Within Bilbao is a medieval heart at Casco Viejo which was built in the 14th century, and is teeming with cobbled lanes, leading to the Basilica of Santiago in addition to an anthropological and archaeological museum, which chronicle an ancient civilisation. The major attraction in Bilbao is the Guggenheim Museum. The museum, which was designed by Frank Gehry, an American Architect, is host to many traveling exhibitions in addition to a priceless collection of contemporary art. Other museums include the Museo de Ballas Artes which is host to both medieval and modern works. On the east side of the river is the Old Quarter of Bilbao. There is a Cathedral built in the 14th century and also a church at the top of town, you'll just need to climb the 1500 steps to reach it! Bilbao is a culture which should be explored.